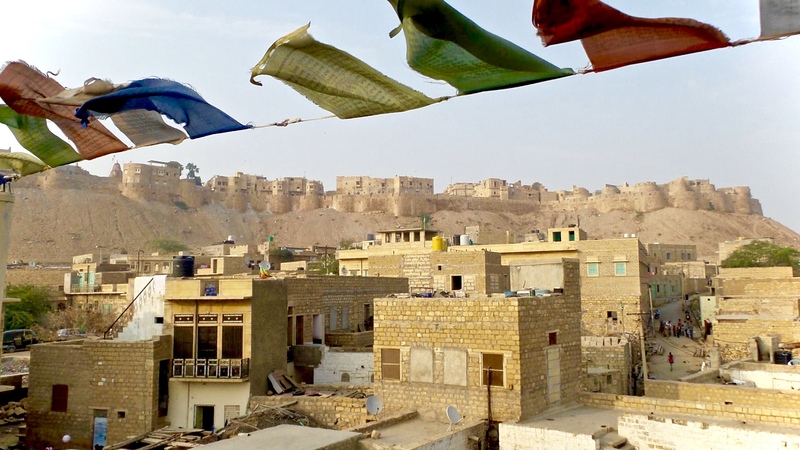 Jaisalmer, a World Heritage Site, is also called The Golden City and its easy to see why. It practically glows under the reflection of the sun. Its proximity to the desert makes it an ideal hub for tourists wanting to explore the sandy side of India. In its center, a stunning fort sits central and looming atop a hill and the winding small roads bustle below. Lovers and friends flock to the small lake around its edge, a respite from the dry surrounding desert. Our desert tour started with a visit to a ghost town called Kuldhara. The town was believed to be abandoned and cursed leaving it inhabitable and haunted. The view is eerie from the few standing buildings. The eye is met with rubble until it dissipates into the nothingness of the vast desert. With the festival in full swing, local celebrities, Mr. Desert and Mr. Mustache of past years were wandering around greeting tourists and taking photos. Lucky us. We happen to be visiting just in time for the annual desert festival, a very popular event that becomes increasingly bigger every year. The festival itself is located on a stretch of large, rolling sand dunes. Across the way a flat area is packed with people watching camel racing. The races are fun to watch but betting is not an option and the camels are not marked. Without knowing what camel is which, there is no way of knowing which to root for. Go camels go! The festival was crowded as well. Tons of locals come out for this event. It’s mostly just families and friends hanging out, playing in the dunes, and riding camels. Attractions and activities seems to be limited but people hung around enjoying themselves till late into the night anyhow. The sunset is worth waiting for. We watched the sun set simultaneously in glowing hues as the moon rose against a blue backdrop and just for that minute it felt like being caught between two worlds. We road our camels deeper into the desert to settle in for the night. A full moon shined brighter than a flood light washing away a sky of stars but creating beautiful dancing shadows against the dunes. We set up camp, had dinner, sang songs around a fire and eventually slept in the open air on thin mats, layering ourselves with as many blankets as possible to shield the crisp desert air. The morning brought with it more stunning views. Practically pinching each other, we shared our disbelief of waking among such beauty over morning chai. With one last sweeping glance, in effort to burn it all to memory, we set off once again riding camels into the big, beige sea. In the last few minutes the calm and quiet of the desert emanated as we entered back into the chaos of Indian civilization.